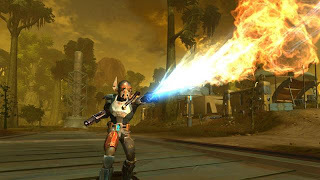 Public interest in all things Star Wars: The Old Republic related is at an all time high. While there are some gameplay elements that couldn’t be discussed too in-depth as of yet – for example what type of crafting system the game will have (personally I’m anxious to find out if we’ll need to craft 20 lightcutlasses before moving up to lightsabers) – Blaine and Jake did their best to provide as much detail for our readers as possible. Blaine Christine: I think really it comes down to scope. Obviously it’s much, much bigger; we’ve talked a lot about how each class has their own story and each of those stories is essentially a full game. It’s literally 100s of hours of story, questing and all of the secondary activities. So when you factor that in with 8 different classes it’s a massive, massive undertaking. And that’s not just about the voice-over obviously. You’ve also got to think about all the different styles of play that people have as well. One of the great things about our studio is that we have a lot of people with a lot of experience working on other MMO titles, so that’s invaluable. We have a lot of people that were from BioWare Edmonton that actually came to Austin and then we have a lot of people that were pulled from the Austin community as well. And as you know there’s a lot of MMOs that have been developed there, so that’s helped out a lot. Jake Neri: I think the other thing too is that [BioWare] have a really sound process that just makes good games. So some of those hurdles that some companies might have, I don’t think that they share because they put a value on constantly playing the game – everybody in the studio has to be on it – and that flushes out a lot of things like balance issues. From day one we really focused on why would this be fun? Why would it be fun for singleplayer, multiplayer, large groups or small groups? Once we nailed that fun it becomes a matter of just iterating on that. Jake Neri: I don’t think we have an official ratio, but what we will say is that we do want the game to be accessible for any playstyle. So if you want to solo the game, you can solo the game all the way through. There will be certain things you couldn’t do because those things are requiring groups much like any other game, since we want to support grouping as well. We want you to be able to be social in both a small group and in a large group. So there is a nice chunk of instanced content, and a lot of that is your story. We have to have key moments happen in an instance because otherwise you’re going to have 50 other people griefing on top of you. Blaine Christine: I think a lot of where we do have that type of content is driven by the story. So if it makes sense in the story because we need a compelling moment like in the demo that we show where you’re running through an Imperial ship and that’s a key moment in the story for us as players, then it’s going to be an instance because that’s what makes sense. So as Jake said, it’s driven by the story. Blaine Christine: We’re not really talking about the way the system itself works, but what we can say is that when you watch the demo, Jake and Tim are actively making choices. If you see our live demos you’ll see that there are different responses, so we’re not just joking, there are actually two completely different paths since you can either kill the captain or save the captain. For us, when we play now, it evolves into sort of a mini-game itself where it’s like, “dude, how are you going to treat the captain? Are you a light side Sith Warrior so you’re trying to spare the captain but I’m a badass Bounty Hunter?” So it becomes a game into itself that’s really fun and compelling, and is unlike anything I’ve ever seen in any other game. Jake Neri: We’re working on the system actively right now. We want to put people in groups and have them have the opportunity to make decisions together or even oppose one another. The thing is everybody can extrapolate out and imagine it would either be crappy or awesome. So we are spending a lot of time carefully architecting to make sure that its fun, you have a reason to do it and that there’s incentive to do that with a friend. Then if you don’t want to participate in that you can also do that content without other people. So it’s a huge, really compelling system and a lot of time is being spent on figuring out how to do it right. Blaine Christine: We can’t talk a lot about details, but obviously all of us play a lot of the various MMOs out there so we want to support the types of gameplay that other MMOs have and are popular. So we want to support different play styles, and we know that guilds are important, so we definitely want to support that. Jake Neri: That’s absolutely right. We have a number of plans for guilds. That’s actually something we hear a lot which is interesting – is there a reason you think people may think we’re not going to support guilds? I think honestly it’s because so much emphasis has been placed on the personal stories up to this point so people are interested in hearing more about the multiplayer aspects of the game. Jake Neri: Ok, that’s cool to understand where that’s coming from. People are playing an MMO and they want that social experience so we will have ways for you to be in a guild, to do cool things with your guild and to maybe even participate in stories with that guild. It’s also nice that you guys obviously got your message across about the importance of personal stories. Blain Christine: It’s funny because that’s almost like a double-edged sword in a way. We’ve been telling people that we are doing story unlike any other MMO, but then people start asking things like, “Are you really doing an MMO?” And it’s hard to demo that in a live demo where we have 15 minutes to run through stuff. 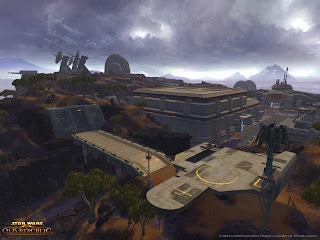 But when you see the outdoor areas in our demo where we’re running around Ord Mantell as the Smuggler or we’re running around Hutta outside the cantina, that’s where the world opens up and it’s not instanced content. So it is an MMO, there’s going to be other players out there and you’ll be able to have all the exploration and combat that you might expect out of an MMO. Blaine Christine: The bottom line with that is that it’s a total rumor since we haven’t talked about pricing structure or subscription plans at all. So people don’t need to worry about anything if that is a worry – we will do whatever makes sense for the game. Blaine Christine: That’s another one of those things that we’re not quite able to talk in depth about, but I think the best way to put it is that we’ve talked about the fact that each class has 100s of hours of gameplay and we want to make sure that it is a unique and diverse experience. So we’ll work hard to make sure that we have the number of planets to make sure that it’s interesting for that much gameplay. When you say 100s of hours of gameplay per class, are you talking about different story branches? Blaine Christine: Basically that’s inclusive of how the average user is going to spend X amount of time exploring and how we think it will play out considering other things like your social activities. So based on that we think the average player will take 100s of hours to get through the story. Jake Neri: And that’s to complete the story as well as all of the action that’s associated with that story. Blaine Christine: Exactly. If you were driving through ‘just’ to complete the story, would it take you that long? Probably not, but if you’re playing as an average person who’s playing through more of the content, then yes it will take that long. Jake Neri: And this is not 200 hours of you sitting and doing dialogue. This includes all of the action, the stories and the missions. We get that a lot where people may think, man am I just going to have to sit down and watch a story? But actually the story, on a percentage basis, is a lot smaller than the actions associated with that story. We’ve got a ton of gameplay per class and that is something that is unique for us, is a challenge for us and it’s a key differentiator and we’re pretty proud of that. How will you travel from planet to planet? (Anacche and RawGutts) For example in previous BioWare games we had the Ebon Hawke and the Normandy that served not only as a means of travel but also had interactive elements that were vital to the overall story progression. Will we be seeing something along those lines here? Jake Neri: We get asked about space a lot. The only thing we can really say here is that we know people want to travel in space and see what that’s like, so we understand where they’re coming from. Blaine Christinie: The only other thing I’d point out there is – again going back to the demo – you’re on an Imperial transport ship and we’re presumably going between two different locations there. But is that the limit or extent of space travel? We can’t really say at this point. Blaine Christine: We actually got the question earlier today where we’ve seen the Sith Warrior has a red lightsaber, so will they “only” have a red lightsaber? And I responded that if you watch the demo a bit closer at the end the Sith Warrior actually has two lightsabers and one of those is purple. Jake Neri: Since definitely the game has factions, I think it’s safe to talk about how the game will have that style of PvP. We can’t talk specific details beyond that right now, but we’ve heard desires for everything that exists plus really fanciful new versions of PvP. I think we’re going to get the class balance right out of the gate, and that will probably be where we’ll focus first just to make sure that that works well. Blaine Christine: If you’re playing as a Sith Warrior, you’ll notice in the demo that you get some light or dark side points during the conversation when you decide whether to kill the captain or not. Like previous BioWare games such as Knights of the Old Republic, you know that those kinds of decisions can influence the powers that you actually get. So yes, light side / dark side will impact what sort of powers you get as a Sith Warrior. Will that have any direct impact on how powerful a given power can get then as your alignment shifts through those decisions? So really it is a challenge. We’re trying to figure out how that nets out in terms of power, or like you mentioned, is it going to make you more powerful or not? I’m not really sure how that’s going to play out and how we’re specifically going to balance that. But because story is important to us and we want people to play the story, we don’t want them to just game it all the way through for the sake of making the most evil Sith Lord or that kind of thing. But the bottom line is that it will have an impact on your powers. Will there be a benefit to staying kind of in the middle? Jake Neri: That’s the thing – there’s going to be a lot of people who want to do that, right? So we have to account for that sort of player as well. So that’s why I don’t think at this point we can give you an answer on exactly what the grade of a power will be because that’s something that we’re still fleshing out. But I think those are the cases; you have the guy that wants to go extreme and the guy who just plays the middle or the guy who wants to go full light side. Blaine Christine: This is another area we haven’t released details on, but obviously we want to support the community in the best way possible. We do watch what other games do and what people want so we certainly want to support those players. We saw the Sith Warrior at Gamescom. Could you give us a quick rundown of what that class is all about? Blaine Christine: We talk a lot about how we want to make sure that each of our classes is different. They’re different not only in story but also in action, so the Sith Warrior is the first class we’ve shown that has lightsaber combat and pretty clearly he instantly starts to fulfill that Darth Vader kind of epic feel, and that’s what his story is going to be sort of similar to which is having that power and evil side. But again, you can make light side choices and not kill people, so you can just be kind of a wussy Darth Vader. So he’s really about that Darth Vader-type character in our world. Jake Neri: In terms of combat he’s definitely a melee class, so he’s using a saber, he’s up close and personal, impaling you or bringing big blows over the top. He’s also got Force Choke which is super fun – that’s actually my favorite thing to do in the game right now. He’s very action oriented, and his sword choreography is really, really impressive. I’m actually amazed at the level of the choreography. Blaine Christine: And since it is the first melee class we’re revealing it really is the first chance anyone’s gotten to see how active our combat is. So going back to what Jake said before, it’s capturing the fun early. What’s fun about all the amazing lightsaber fights that we’ve seen in the movies? It’s this incredible, fast paced action and that’s what you get out of that class when you watch it but also when you play it. And because it is so fast it’s fun for the player but it’s also even fun for me to demo and watch. Jake Neri: One last thing about the combat that we have shown, is that we haven’t really shown anything past around level 8, but I think even the stuff there is pretty exciting and visceral and more action oriented – and you’re only seeing a level 8 even. So we want you to be having fun and feeling heroic immediately. That was a goal we set which I think we’re delivering on. Going back to what you were saying about “what’s fun in Star Wars”, to me you captured that really well in the captain scene in the demo where there’s lots of combat going on in the background or even in the CG trailer where you see the transport pull up and then seeing all those lightsabers. Are you going to be seeing those kind of moments in the actual game where you may have dozens of Sith that you’re fighting alongside of? Blaine Christine: I think that’s certainly a goal. Someone earlier mentioned, “I noticed in the Smuggler footage you see NPCs taking cover.” From there he asked if we’ll ever see cases where NPCs are fighting each other, and I mentioned how if you watch the transport scenes you do actually see that. The Imperial troops are actually helping us out as they’re blasting away at the Republic troopers as they come in from those pods, so you have both factions dueling right there as you’re going in and being the one to finish off the fight. Speaking of the cover system, will other classes be able to take advantage of that to some degree, or is it more specific to the mechanics of the Smuggler class? Jake Neri: I think right now we’ve just shown the Smuggler using that. It’s a tenant of that class for sure and we haven’t really shown other classes using it. Blaine Christine: We get a lot of questions about, hey why would people want to be anything other than Sith or Jedi, and we feel like it’s on us to make sure that the design is such that we as players feel compelled to play those other classes. For my part I can honestly say Smuggler is one of the most fun classes because I love rolling into cover and then using the flashbang and taking enemies out with a barrage. So it’s just a different gameplay element to play with. Jake Neri: It makes the Smuggler unique. So a goal of ours is to make sure that each class, while it has a unique story, it also has a unique style of play and a unique combat system. Jake Neri: Well people can’t imagine, because the Jedi and the Sith are so powerful and amazing, but it would be silly of us to just make the one-shot Jedi game, you know? Blaine Christine: And then the other one that comes up is the Trooper. Why would I want to be a Trooper? If you read up on the Trooper on our website or when we talk about it, all of our classes are based around the idea that you truly are heroic or are a hero both in your story but also in your combat. 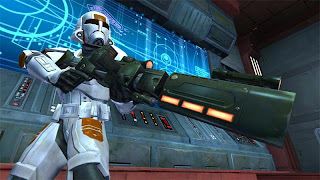 So using the Trooper as an example, he’s a member in an elite squad in the Republic, so it’s like he’s the green beret essentially of the Republic troopers so he’s not just a generic clone trooper somewhere. So since they are heroic, if you are the absolute best Trooper in the galaxy would you be able to take on a Jedi? Maybe, if you’ve got the right tools. Well we appreciate the two of you taking the time to talk with us!